This one is for the gentlemen who want to show their girl "a whole new world" of magical dates at the Happiest Place on Earth! Have you ever wanted to take your lady out to the night of her life? 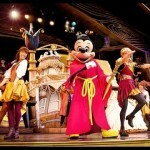 The Disneyland Resort is a prime location for some fun and romance. It has the uncanny ability to bring out the inner wonder in everyone of us. Make sure to keep this guide in mind and I promise that you and your date will always have smiles on your faces. Moreover, it is a wonderful time to go with your favorite girl and show her the magic with the Diamond Celebration right around the corner! First things first! Before you even step foot in the parks, you are going to want to make sure you reserve a table for a romantic dinner at one of the beautiful restaurants. A favorite spot is the Blue Bayou in Disneyland Park, very classic restaurant that is located inside of the Pirates of the Caribbean ride itself! Ariel’s Grotto in Disney California Adventure has delicious food in a prime location on Paradise Pier and also serves some great alcoholic beverages for the Disney-goers of age. If you are on a budget, there is nothing more romantic than making her favorite food and packing a lunch for the both of you. You’ll have to eat it in one of the picnic areas just outside of the parks (but we didn’t say or see anything if you snuck in a snack or two…). Do you want to wear buttons to the park, but aren’t sure which ones to wear? Try this shop to get some creative buttons for you and your lady to wear and be the envy of all the other couples. The popular “I’m his Minnie” and “He’s my Mickey” buttons are very available. Many people think that Disneyland and Disney California Adventure is too crowded and the lines are too long to have a romantic time, but on a date this should be an advantage! Getting to know someone in line is easy and fun, it also makes the line seem like it is going much faster. Finding some common ground if this is your first date is a great step into breaking the ice. Having trouble coming up with conversation? Play some games such as 20 Questions or Charades. They have these apps on your phone as well and after a couple rounds you will find plenty of things that you have in common or that you find interesting about each other. Making her laugh is the fastest way to her heart, so don’t be afraid to joke around and say what comes to mind to let the conversation flow! Getting to the park early is a good idea to beat some of the lines for the most popular attractions. To save more time off your date, go tackle Disney California Adventure Park before lunch because its is a smaller area to cover and less people there in the beginning of the day. The first thing that you and your date need to make sure you do is get a FastPass to watch World of Color at the end of the night. These tickets go fast and it is one of the most amazing shows that you will see. Make sure to end the night with this incredible show and you both will not regret it. 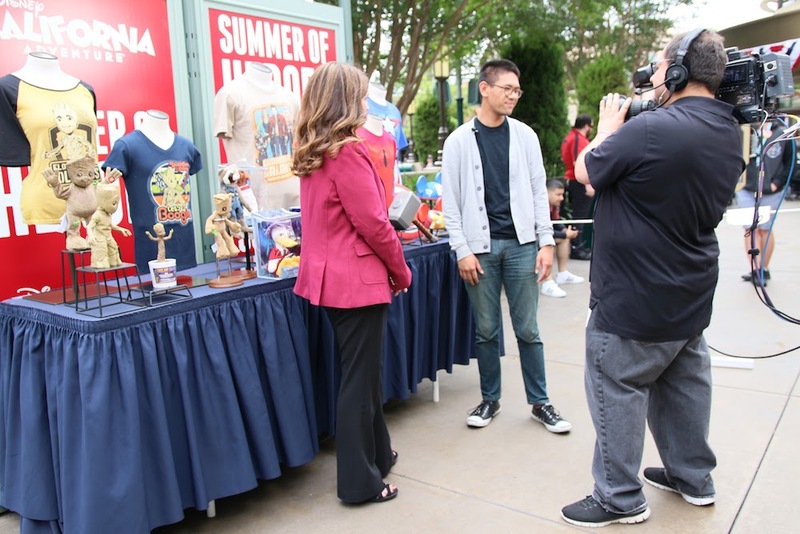 After grabbing those FastPasses, there are many options of wonderful rides and shows in DCA! Is your date a thrill seeker and loves to have a good time? Head over to Paradise Pier for a roller coaster attraction with California Screamin’. This is a great ride to start off the day with, and it’ll get your blood pumping for the smoothest roller coaster around with twists, turns, and loops that will make you and your date squeal with excitement. The Twilight Zone Tower of Terror in Hollywood Land takes you into another dimension and then drops you back into reality. This would be a good opportunity to hold her hand if she gets a little nervous or jumpy (or vice versa). A fun new attraction that came into the park a couple of years ago is called Radiator Springs Racers. This Cars Land ride is incredibly popular, but also well worth the wait. 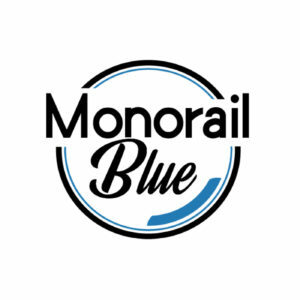 Starting off as a nice enjoyable ride through the world of Cars and ending with a high-speed race to the finish line, this ride is great for adrenaline junkies and riders who prefer a more relaxed ride. What do these three rides in Disney California Adventure have in common besides being fast-paced and exciting? They have cameras! Make sure to make a funny face when the time comes and make her laugh, as I mentioned earlier the fastest way to a girls heart is having a good sense of humor. It may be getting warm in the middle of the day, so cool off with a ride in an air conditioned attraction likeThe Little Mermaid’s Under Sea Adventure or a water attraction like Grizzly River Run. They are a blast to go on and keep you refreshed and ready for the rest of your day in the parks. 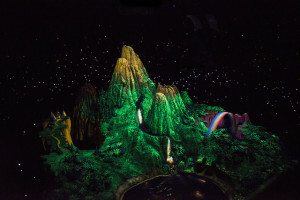 Back in Disneyland Park, there are plenty other thrilling attractions that are very popular such as Space Mountain, a roller coaster completely in the dark with just stars to light your way, and the Indiana Jones Adventure where you go on an rough ride through catacombs and dangers lurking around every corner. You even get to help Indy out of a sticky situation and save the day. There is also the Matterhorn which is an intense and fast roller coaster where you get chased by an Abominable Snowman, but what if your date is not a fan of giant attractions with big drops and fast speeds? Don’t you worry, the Happiest Place on Earth provides its guests with much more romantic attractions and atmosphere for you and your beautiful date. Even with all the fast-paced attractions, slowing things down and having some more personal time with your lady on your magical date is important to get to know her and make her day one that she will never forget. 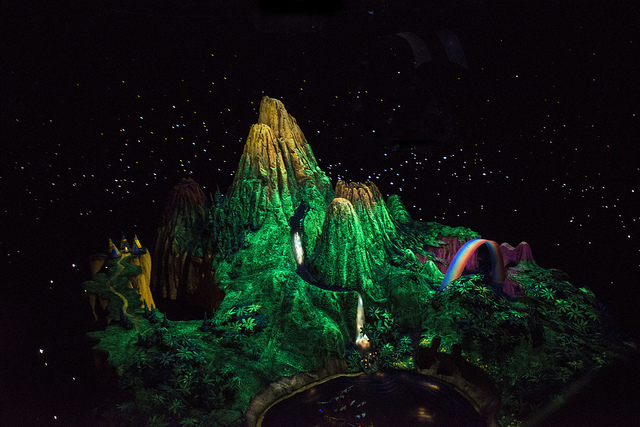 Peter Pan’s Flight in Fantasyland is a nice relaxing ride through the world and story of Peter Pan where you and your special woman can get comfy and cozy flying through the night sky headed into Neverland. 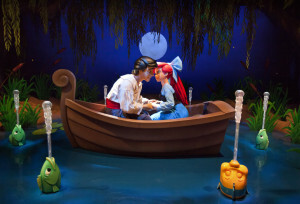 There are many rides that take a lovely couple through a different world of the Disney universe and allow for cuddling during the ride. Set sail on a slow and pleasant cruise through the world the Pirates of the Caribbean where pirates and scallywags sing to you as your ship travels from Port Royal to Tortuga. In this ride, you can get some brownie points if you can show her the hidden Mickeys on the port and starboard sides. The Haunted Mansion is great place to get comfortable with your date, especially in those Doom Buggies. This will give you two some alone time and you will always be there for her if she gets frightened. Buzz Lightyear Astro Blasters in Tomorrowland will let you get competitive with your date, shaking things up a bit. Let the competition bring you closer together and at the end of the ride you can see how serious you were in defeating Zurg to be the galactic hero. The fun does not stop at the attractions, the Disneyland Resort is much more than that as happiness is around every corner and simply strolling around is a fantastic time here. These parks are filled with music, laughter, and joy not only inside the rides but all over the resort. Still, it gets pretty packed at both parks, so first rule of strolling with your date… hold her hand so you don’t get separated. While roaming around you could run into some of your favorite characters such as Mickey, Minnie, Goofy, Pluto, Donald and much more. The two of you may also stumble across DJ Dance and Drive-In Cars Land. In this show they allow you to dance with the performers and it is a great way to impress your date with your spectacular moves or simply make her smile with your not so fantastic ones. Be the envy of everyone else as you dance with your lady on the dance floor to some great music. If your lady loves animals, Big Thunder Ranch Petting Zoo in Frontierland is a great place to stop. Get up close with some friendly barnyard animals such as cows, goats, sheep, donkeys, and pigs. Disneyland and Disney California Adventure Park have parades that are unique to themselves. DCA’s Pixar Play Parade is filled with all your favorite Pixar characters that come and interact with the crowd. They allow you to take quick pictures with them and sing along with the classic songs that are iconic from their movies. In Disneyland Park, Disney princesses come out to play with Mickey and the crew. The only way to describe the atmosphere during these parades is magical. 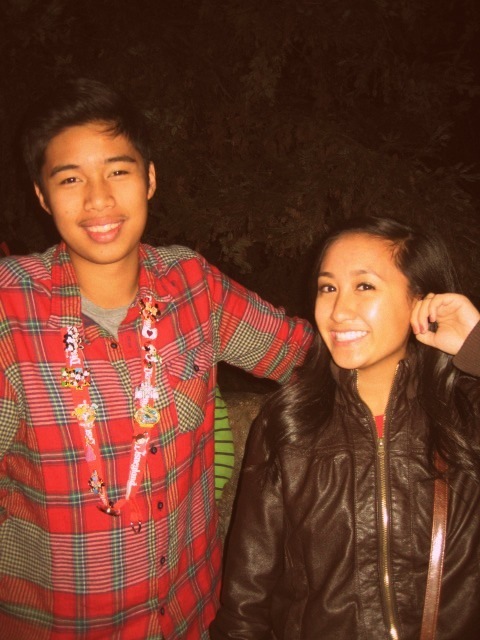 You will not regret taking your girl to see these spectacular parades because there will always be a smile on her face. There are great locations for food in Disneyland and DCA that are cost friendly and delicious for you love birds to eat at. 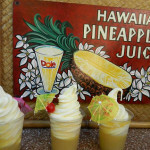 The Tiki Juice Bar right at the entrance to Adventureland is a popular place for their famous Pineapple Dole Whip and Pineapple juice that are renowned throughout Orange County and beyond. 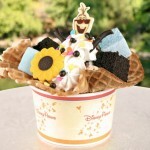 For a nice refreshing ice cream sundae on your hot date, go visit the Gibson Girl Ice Cream Parlor right off Main Street U.S.A. and cool off with their special Olaf’s Perfect Sundae Day for a delicious treat. For a delicious and affordable meal any time during the day, visit Jolly Holiday Bakery also on Main Street U.S.A. for their toasted ham and swiss on ciabbatta and Jolly Holiday Combo (grilled cheese with tomato basil or chicken noodle soup). DCA also serves up some free, delicious snacks at the Ghirardelli and the Boudin Bakery Tour in the Pacific Wharf area. Disneyland Park is an experience that you won’t find anywhere else. Not only is it clean, have the greatest rides, not to mention the ability to bring two people closer together than they thought possible, the performances will blow your mind and allow you to get close and personal with your date. Mickey’s Magical Map in Fantasyland is performed all day from 12 PM to 6 PM. You can catch this incredible show almost every hour between those times. In this performance, you will find different princesses singing songs that you can sing along to, along with special guests that you do not want to miss. This amazing live show at the Fantasyland Theater has a few special love songs that will set you in a good mood for the rest of your day. Make sure to get good seats next to your date as her heart fills with joy when she sees the light with Rapunzel and friends. 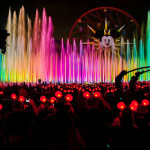 Last but not least, don’t forget to use your FastPasses and watch your showing for World of Color back in DCA! None of the shows compare to the World of Color at the end of the night. The show features projections of your favorite Disney movie moments on a giant water screen with some incredible special effects that will dazzle your date and make the night unforgettable. After getting to know your date and getting closer with her all day, the end of the night is the opportune moment to cuddle during the show. Sway with her to the music and at the end you will be in for a treat. Love is in the air and the mood is set perfectly to get the kiss you were waiting for all day. Clearly, the Disneyland Resort never fails to grow your relationship while creating beautiful experiences. If it is your first time out together or you have been together for years, it brings out the best in everyone, making your love grow while you visit. 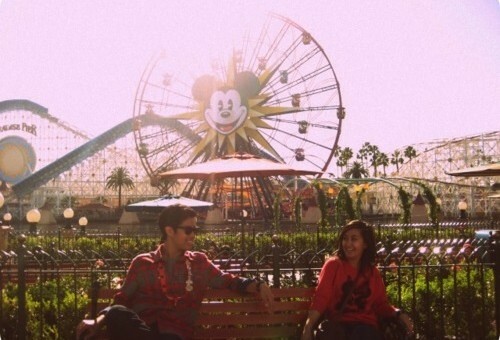 Let’s not forget that love is part of the magical experience and as a result makes Disneyland the perfect location for lovebirds who want to have the time of their lives together.